If one considers the conditions and starting position from which Alexander launched his attack on the vastly superior Persian empire, the question of how Alexander achieved victory over the mighty Persian army arises again and again. This victory came as such a surprise to the self-confident Persians that Darius, for example, had brought members of his family with him to Issus, including his heavily-pregnant wife, who then fell into the hands of Alexander. The mosaic provides us with an answer to this question, representing not just an artistic masterpiece, but also an historical insight into the chain of events leading to Alexander’s victory. The middle of the picture is compositionally and morally dominated” (Curtius) by Darius (1). Eyes widened in horror, he looks to the left, as a kinsman of his bodyguard is pierced by Alexander’s spear (2). The dying man’s right hand is still gripping the deadly weapon, as though he wished to pull it out of his body, but his body is already collapsing onto the bloody corpse of his black horse. The sympathetic but uselessly-extended right hand and the uncomprehending stare of Darius are directed towards the fatally struck man, who has thrown himself between him and the oncoming Alexander. The gaze and gesture of Darius are however also directed towards the approaching Alexander (3). The Persian king is not himself fighting, and is therefore already the passive victim of the general horror. In contrast, the Macedonian king is actively directing the battle. From astride his Bucephalus (4), he strikes the enemy through the body with his spear, without so much as a glance at his victim. His widened eye is trained on Darius; even the Gorgon on his breastplate turns her view sideways to the horrified enemy, as if she wanted to increase the suggestive power of this eye. 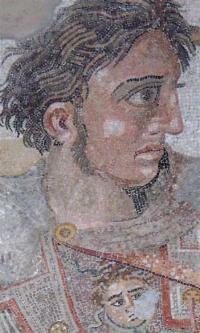 The portrait of Alexander corresponds to the so-called Lysippean type, which includes for example the Pergamon Head. Alexander is not idealised here in the otherwise frequent form: with long curls and full, soft features as the incarnation of Zeus, the sun-god Helios or Apollo […]. His head appears rather more gaunt, with tautly shaped cheeks, marked by suggested or deeply-carved wrinkles and with short hair barely covering his ear. Both types, the realistic and the idealising, do admittedly show the parting of the forelock characteristic of Alexander - here as short, unmanageable strands, in the deifying variation as upwardly radiating pairs of locks. A later, but unmistakeable echo of this hairstyle can be found in the consciously stylised, characteristic forelock of Augustus. Also on account of the damage to the mosaic, there are few Macedonians – recognisable by their bonnet-shaped helmets – around Alexander The majority of the picture, almost three-quarters of the total surface, belongs to the Persians. The Persians are wearing the Central Asian scale or plate armour. This covers the entire body and is made of squares of iron or bronze rods, which were connected at the top, bottom and sides by cords. Painted in radical foreshortening, a Persian in front of Darius seeks to subdue a shying horse (5), which may belong to the person who has fallen to the ground beside him (6). 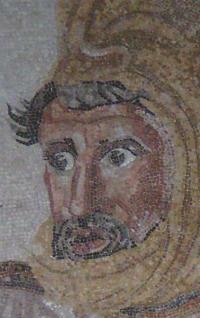 The face of the dying man, who has just been run over by Darius´s chariot, is reflected in his shield and is the only thing that looks at the beholder. The composition line of the three Persians, sloping from left to right, the man pierced by Alexander (2), the horse subduer (5) and the dying man (6), follows the internal and external movement of the image. The same line is repeated to the right of the charioteer’s whip (7) over the reins to the legs of the horses, who swing the king´s chariot wildly to the right to flee. At its midpoint and centre, depicting the group of the horse subduer (5), Darius (1) and the charioteer (7), which is highlighted by the round of the chariot wheel, the picture shows the decisive turning point of the battle. The mastery of the artist, who chose to depict this “turning point” in the battle, becomes clear when compared for example with the "Battle of Alexander" by Altdorfer: there, an already-fleeing Darius is simply pursued by Alexander, a comparatively simple and unexciting theme. Here, in contrast, the many spears pointing diagonally left and upwards and Darius´s posture still reflect the Persian line of attack. This line of attack is literally pierced in the upper body of the man who has been pierced (2) by the dynamically contrasting line emanating from Alexander. The angled left arm of this Persian and his leg already record the movement in the opposite direction, meeting then with Alexander’s spear directly in the centre of the image and ending in the whipping arm of the charioteer (7), who triggers the flight. The three spears at the right edge of the picture signal this escape, which will soon swing around the other spears still directed towards Alexander. The movement of these enemy lines in the opposite direction is also repeated suggestively in the trunk and branches of the bare tree. The answer that the picture gives to the question of Alexander’s superiority could be summarised along the following lines: The unflinching, determined audacity of Alexander, a posture reflected in his widened eye and the piercing spears, has such a horrifying and overwhelming effect on his opponents that they flee in panic. However the representation grants honour and a human dimension to this opponent, as can be seen in the gesture of Darius and the three Persians fighting in front of him. Sympathy and regard is also shown to the vanquished, as in the “Persians” of Aeschylus. The answer in the picture corresponds to our historical knowledge: at Issus and again at Gaugamela, Alexander decided the battle by an unusual tactical manoeuvre. He charged each time in a circle of his mounted Hetairoi, a type of elite troop, into enemy lines, using this surprise attack to create resistance and so appearing before Darius completely unexpectedly, causing him to flee in panic. Alexander treated the prisoners with a level of care and regard to which they as Persians were completely unaccustomed. The picture, therefore, does not reflect a definite battle by Alexander, but rather it reconstructs to a certain extent the typology of his victory. I would like to suggest an alternative interpretation of this mosaic. One that is not at first glance apparent. The spears in the rear moving from right to left are usually seen as the Persian spears but the Persians did not use the long sarissa of the Macedonian pike phalanx. I think this is key to understanding the moment in the battle depicted. The Pikes in the rear are the Macedonian pikes pushing left and toward the viewer. Darius is fleeing away from them toward the viewer. Alexander and his Companion cavalry have flanked around the right side of the pike phalanx and are charging into the rear and flank of the Persians, cutting off Darius escape. It is surely the crucial moment of the battle but at this moment Darius is almost surrounded. The Macedonian pikemen behind him and the macedonian cavalry charging into his rear as he tries to flee. I imagine the Romans were well aware of the hammer and anvil, cavalry and pikes tactics that Alexander used to conquer the Persians at Gaugamela and this mosaic shows the winning charge of this battle. When I first looked at the mosaic I was surprised to see the Persians had pikes and then it occurred to me that the pikes in the background were greek. Suddenly the whole scene is reinterpreted and gives tactical information about the tactics of Alexander. Pin the the enemy army with the pikes and then lead a heavy cavalry force around the right flank to charge into the rear. It's all there in the mosaic.